Light therapy is the fountain of youth your skin has been looking for. See your skin transform before your eyes. Photo rejuvenation or LED Light Therapy is the use of various colors of light emitting diodes (LEDs) that create an anti-aging effect on the skin. Exact wavelengths of light emitted from LED's stimulate and energize cellular activity, which in turn creates collagen and elastin for Anti-Aging benefits. LED Light Therapy has become recognized as one of the safest, quickest, and most affordable ways to achieve younger-looking skin. It's referred to by several different names including: Photo-Rejuvenation, Anti-aging LED Light Therapy, LED Light Therapy or Red/Yellow Light Therapy. Our clients love the drastic and beautiful results..
Collagen: the secret to ageless, baby-smooth skin! The technique stimulates the production of new skin cells and collagen, which results in a younger looking complexion. Collagen is a protein in your skin that's abundant when you're a child and makes skin appear taut and smooth. Collagen production declines as we age, resulting in looser, uneven skin. 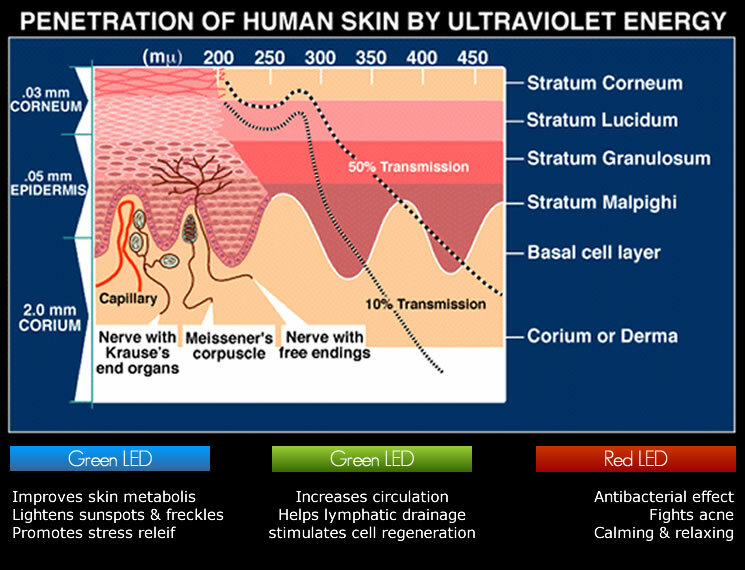 Laboratory studies have shown that skin cells grow 150-200 percent faster when exposed to certain LED light wavelengths. Independent research for over 40 years has shown LED red and infrared light delivers powerful therapeutic benefits to living tissue. Both visible red and infrared light has been shown to affect at least 24 different positive changes at a deep level. Visible red light, at wavelengths from 630-660 nanometers, penetrates tissue to a depth of 8-10 mm. LED light is very beneficial in treating problems close to the skin's surface such as wounds, cuts, and scars. Skin layers, because of their high blood and water content, absorb red light very readily and deliver enough energy to stimulate a response from the body to heal itself. Light photons must be absorbed to produce a biological response. All biological systems have a unique absorption spectrum; this uniqueness determines which wavelengths of light will be absorbed to produce a given therapeutic effect. The visible red and infrared portions of the spectrum have been shown to be highly absorbent and produce unique restorative effects in living tissues. It is thought that light photons are absorbed by the skin and underlying tissue and triggers biological changes within the body in a process know as photo-biomodulation. Although the exact mechanism of action is still undergoing study, what is known is that monochromatic light increases oxygen and blood flow, facilitating wound healing. 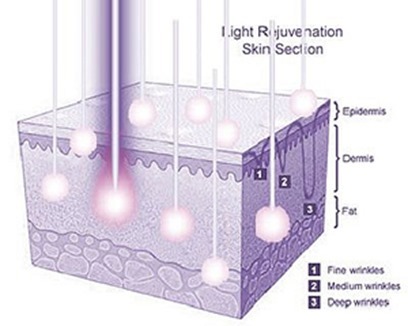 Light emitting diode or LED therapy is a non-invasive procedure that activates skin cells with pulses of low-level, non-coherent and non-thermal light energy. LED therapy pumps light energy into the skin cells, where this energy stimulates the skin cells in a manner similar to photosynthesis, which is the process where plant leaves take sunlight and convert it into food energy. LED therapy is one of the few non-invasive tools available that can reverse the appearance of aging skin, such as wrinkles and mottled skin tone. LED light therapy at AuM provides a treatment that penetrates deep into the skin to erase the appearances of aging - such as fine lines, wrinkles, enlarged pores, and crow's feet. The light stimulates skin cells to produce healthy, new skin-plumping collagen and slow the breakdown of existing collagen. When study subjects were exposed to this light daily for 6-8 weeks, they had a measurable improvement in fine lines and wrinkles. It stimulates collagen production, smooths fine wrinkles, and improves skin texture..
As we all inevitably age, our skin loses some of its ability to heal and reconstruct itself. Components such as collagen and elastin, which are necessary in maintaining the physical appearance and vitality of our skin, are reduced as we age. This safe and all natural helps in the healing of aged and damaged cells — scar tissue, toxin and waste build-up (acne, wrinkles, sunspots, hyper-pigmentation, etc). Sometimes in our life the increase and appearance of physical flaws and characteristic skin discoloration and texture can become overwhelming. At AuM we use the latest LED technology in our lighting system that sends out visible red & yellow light waves at an optimized pulsing rate that in turn gives the skin the necessary energy to reduce these and many other signs of aging. 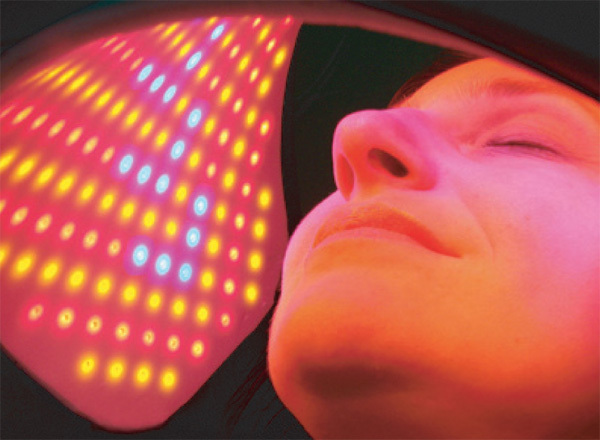 LED Light Therapy is great as a corrective treatment or as a regular ‘maintenance’ routine. We’d be happy to have one of our trained, clinical aesthetician consult and answer any questions in person, or make an appointment for your first treatment.